The tension between classic and modern, traditional and progressive is a fine line. And the world of fine furniture design is not immune to this creative dynamic. Yet, only infrequently does a piece of furniture effectively blend the old with the new so effectively that a sense of timeless beauty emerges. But the Santa Fe Mission Dining Table does this perfectly. And it does so with Strength & Style: Sante Fe Mission Dining Table. 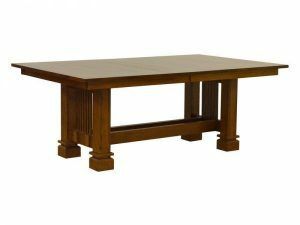 The Sante Fe Mission Dining Table blends classic and modern designs. The Sante Fe Mission Dining Table, pictured here, boasts an original take on the classic Mission style. Also, it features a one-inch skirting, Mission edge and sturdy wood slats. In addition, it comes with carved feet, double equalizer slides and leaf self-storage. So with all these kudos, the Sante Fe Mission Dining Table should remain a cherished piece for generations to come. What’s more, this dynamic piece also comes with a variety of custom options. And they include wood species, stain/paint/dye, size, leaf storage and edge choice. To see more of our selection of dining tables, visit Brandenberry Amish Furniture. Or visit our ‘brick and mortar’ store in Shipshewana, Indiana. And see why Amish-crafted furniture is timeless in its appeal.